Trying to find a Private Internet Access (PIA) coupon that really works? The bad news is that there is no way you can use a money-saving coupon on PIA website. But this is not the end of the road! You can still save money on Private Internet Access subscription by checking out the deals and offers that we have listed below. 1) 52% Off On Annual Plan – That means a big saving of $43.45 right away! With this truly amazing offer, you can subscribe to Private Internet Access for one whole year by paying just $39.95 ($3.33/month). This is an extremely attractive price for a top grade VPN service especially when you consider that you would have paid $83.4 had you subscribed to the monthly plan and renewed it every month. As far as VPN savings go, you won’t find a better deal! 2) 13% Off On 6-month plan – Immediate saving of $5.75 on PIA’s 6-month plan. With this option, you get to subscribe to Private Internet Access for a period of 6 months for $35.95 ($5.99/month). 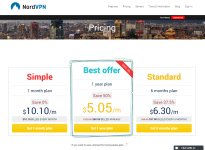 Since there is almost negligible price difference (just $4) between 6 month and annual plans, we recommend subscribing to the annual plan even if you are looking for a short term subscription option. 3) Monthly Offer – If you are looking for month-to-month PIA saving options, there aren’t any coupons or deals available right now. The monthly subscription price of PIA is already very low and you are getting access to one of the best privacy solutions for a low price of $6.95. To take advantage of the above deals, visit the Private Internet Access by clicking on the links posted on this page. Once you have selected your plan, you will see the reduced prices directly during checkout. Private Internet Access also unveils seasonal deals and offers for special occasions. Recently the company had a Memorial Day promotion that offered extreme discounts on the already low prices. When the next deal becomes available, we’ll make sure to post it here. How Good is Private Internet Access VPN Service? Private Internet Access (PIA) is a leading privacy service provider that specializes in proxies and VPN services. The service was launched in 2010 and since its inception; it has helped more than 100,000 customers to secure their internet. Private Internet Access offers inexpensive VPN plans but it doesn’t compromise on performance or security in any way. Private Internet Access has more than 1,400 servers in 10 different countries. The deployment of so many servers indicates how serious the company is about delivering a high performance privacy solution. With a Private Internet Access subscription, customers would never have to deal with lags, delays, buffering or “Content Unavailable” messages. Not to mention, the service helps you to protect your privacy and bypass surveillance from anywhere.